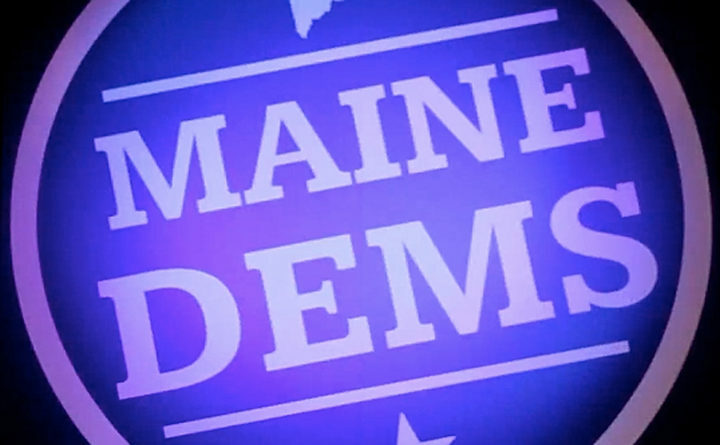 The Maine Democrats' logo is projected on a big screen at the Maine Democratic Convention in Augusta in this 2012 file photo. AUGUSTA, Maine — The Maine Democratic Party asked the state’s ethics watchdog on Tuesday to investigate their Republican counterparts and an anonymous “news” website that they accuse of helping derail a progressive Lewiston mayoral candidate’s campaign last year. The complaint, filed with the Maine Ethics Commission on Tuesday, alleges that the Maine Examiner “likely” made expenditures in that race that should have been reported under state law and that “there is reason to believe” that the Maine Republican Party worked with them. There is no direct evidence that the Maine Republican Party coordinated with the website, but on social media, party staff shared Maine Examiner articles critical of progressive activist Ben Chin, who lost the mayoral race by 145 votes to Republican Shane Bouchard in December. Among Maine Examiner articles about Chin were ones highlighting real emails leaked from his campaign in which the candidate said he ran into “a bunch of racists” while stumping. The site also highlighted Chin’s history of unpaid parking tickets, though they alleged that the tickets went back “years” when they only went back to September. The complaint asks the commission to investigate whether the Maine Examiner broke election laws and find out whether the Maine Republican Party coordinated with the site. Party spokesman Garrett Murch said in December that he didn’t know who ran it and declined comment when asked if the party coordinated with it. In a statement, Maine Democratic Party Chairman Phil Bartlett said the site should not “cower” behind secrecy and that Republicans should say if they’re using the site to “advance their partisan agenda.” Murch didn’t respond to a Tuesday evening request for comment. The Democrats’ complaint effectively treats the site’s articles as anti-Chin ads, saying the Maine Examiner may have violated laws forcing entities making expenditures of $250 in a municipal election to report them to the city or town and provide information about the funder. But media outlets are exempt from disclosure provisions under state law, so the case could prompt debate about whether the Maine Examiner is a media outlet. Democrats argue in the complaint that it doesn’t qualify because of its use of anonymity.